Dogs that Do Not Shed: Are these Hypoallergenic Dogs? Are these truly Hypoallergenic Dogs? According to the 2009-2010 National Pet Owners Survey, about 45 million American households own at least one dog. At the same time, it’s estimated that up to 10 percent of the U.S. population, or 30 million people, may be allergic to animals. That means there are likely a lot of people who love animals who may have difficulty owning one. Fortunately, there are some dogs that do not shed, or at least which do not shed much. These dogs are often suggested as dogs for people with allergies. There is actually no such thing as “hypoallergenic dogs” or hypoallergenic dog breeds. People who are allergic to animals, and to dogs, are not specifically allergic to dog hair. They are allergic to a dog’s dander. Dander is the flakes of skin that come from the dog. The dog’s saliva, which is often on the skin where the dog has licked himself, is also a factor. The hair is only a secondary issue. However, the hair can pick up dust and, if it sheds a lot, can spread the dander and saliva through a home. All dogs do have dander and saliva, but some dogs shed much less than others. There is probably no dog that sheds zero amount of hair, but there are some breeds that shed very little. As you can see, some of these breeds have quite a lot of hair, such as the Maltese. However, they do seem to produce less dander than other breeds. Some of these breeds also have single coats. Most dogs have double coats, or a warm undercoat and a harsher outer coat to protect them against the elements. A dog with a single coat usually sheds less hair. 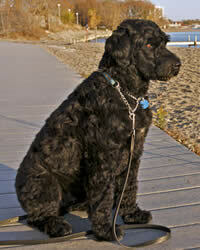 Dogs such as the Bedlington and the Kerry Blue Terrier have coats that continue to grow without shedding. They have to be groomed to remove dead coat. The Chinese Crested and Xoloitzcuintil are hairless breeds so they naturally produce less hair than other breeds. If you do have allergies and you are looking for a dog, remember that all dogs are unique. You may do well with dogs from some of these breeds but it is always best to meet an individual dog and see if you have an allergic reaction to it. You may also find dogs from other breeds that do not trigger an allergic response in you, for whatever reason. Meet the dog in person and then choose a dog that you can live with. If you find a dog that doesn’t trigger your allergies, you will need to do some extra housekeeping. Vacuum often. Wash bed linens frequently in hot water. Clean blinds and other places where dander and hair can accumulate. And bathe your dog frequently. If you follow these suggestions you should be able to eliminate most of the dander and dog hair in your home that could trigger an allergic response. Finding dogs that do not shed can be a challenge. Some of these breeds are relatively rare, although Poodles and the Bichon Frises are very popular breeds. If you have your heart set on one of the harder to find dogs, keep looking and meeting dogs and you will eventually find a dog you can live with without triggering your allergies.